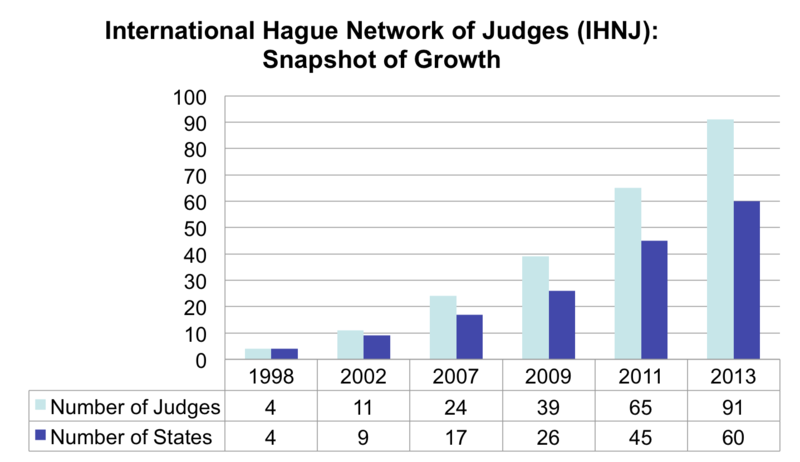 The International Hague Network of Judges (IHNJ) attracted 20 new judicial designations in 2013, growing from 71 to 91 judges worldwide. A total of 60 States have now officially designated a judge to the IHNJ, with 11 new States designating judges in 2013 alone. New States designating to the network in 2013 include Belize, Estonia, Italy, Morocco, Pakistan, the Philippines, Poland, Rwanda, Slovakia, Slovenia and Switzerland. Including changes to existing designations, the IHNJ welcomed a total of 28 new judges in 2013. The IHNJ began some 15 years ago with judges from China (Hong Kong SAR), New Zealand, the United Kingdom (England and Wales), and the United States of America. The creation of the IHNJ specialising in family matters was first proposed at the 1998 De Ruwenberg Seminar for Judges on the international protection of children. It was recommended that the relevant authorities (e.g., court presidents or other officials as is appropriate within the different legal cultures) in various jurisdictions designate one or more members of the judiciary to act as a channel of communication and liaison with their national Central Authorities, with other judges within their jurisdictions and with judges in other Contracting States, in respect, at least initially, of issues relevant to the Hague Convention of 25 October 1980 on the Civil Aspects of International Child Abduction. It is now recognised that there is a broad range of international instruments, both regional and multilateral, in relation to which direct judicial communications can play a role beyond the 1980 Hague Convention.